Palate/Finish: Wonderful spices, bringing nutmeg, vanilla, Morella cherry, & aniseed. A powerful, rounded Cognac with an exceptionally lengthy finish. 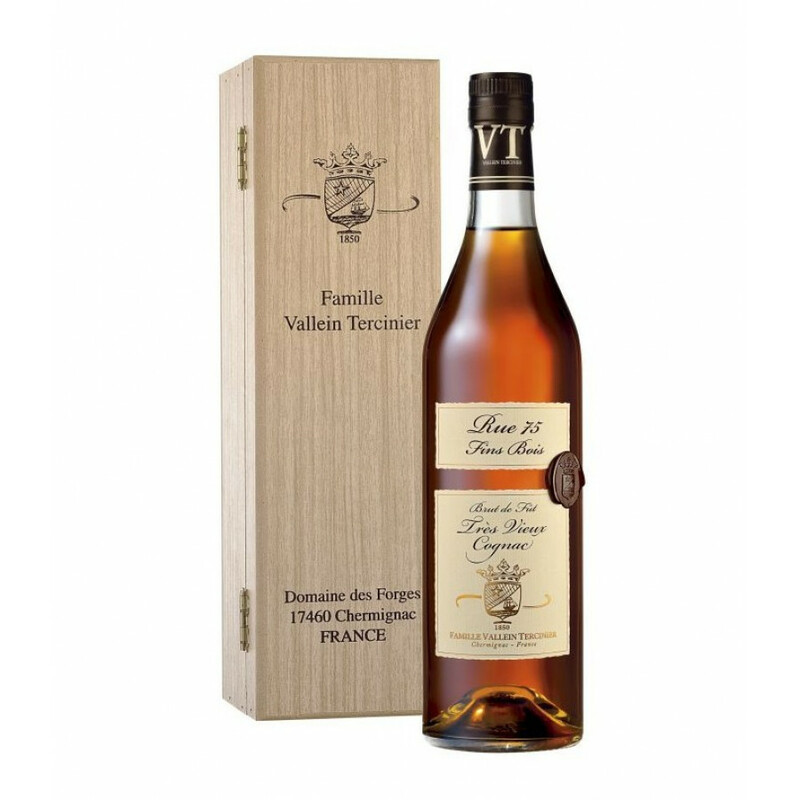 The Vallein Tercinier Rue 75 Fins Bois Cognac is an exceptional single cask offering from this family run producer. A vintage from the year 1975, this really is a magnificent example of the very best that Fins Bois eau-de-vie has to offer. Cognacs from this growth area of the region are becoming more and more popular, and for good reason—they offer a very distinct taste profile that’s unique from all of its neighbors. Fins Bois eau-de-vie, and especially one of this quality, is such that it needs to be experienced by anyone who appreciates the finer things in life. And for those who enjoy their Cognacs to live life on the spicy side, then this Tres Vieux single barrel delight will truly bring you the taste experience you crave. The house of Vallein Tercinier is the epitome of a family run, craft brand. The history of the family’s wine making expertise can be traced back over 500 years. Today they continue to embrace all the tradition that’s made them what they are, yet are also utilizing all the technological advances that the 21st century brings. The end result is a forward thinking Cognac brand that has never forgotten its roots. Not to mention that they bring to market some very special Cognacs indeed. Presentation is very important to the house of Vallein Tercinier. And Rue 75 is no exception. The bottle is of a traditional Cognacaise style, with a classic, gold embossed label and wax seal. This is further enhanced with a quality wooden presentation box that features the family crest. This vintage Cognac is best enjoyed in the time-traditional manner—neat, as a digestif, and when you have the time to savor the sensory journey on which it takes you. A great addition to any collection. With over 500 years of history, the artisan house of Vallein Tercinier is one that deserves the attention of all Cognac lovers – from those new to eaux-de-vie to the connoisseur. This brother and sister team bring an expertise to craft Cognac that's just aching to be discovered. Many of their Cognac's have been awarded top class awards in many industry competitions, and this has meant a growing awareness of their products in some quarters. But, as with the aging process of Cognac, such a small craft brand is often lost amongst the noise razzmatazz of the 'big boys'. And that really is a crime, because as many esteemed connoiseurs are finding out, the offerings of Vallein Tercinier are of superb quality, unique, and once you've discovered them, will become a 'must have' brand to always have in your drinks cabinet. Eye: Deep, reddish amber. Nose: Complex nose, with notes of saffron, nuts, leather are traversed with a fresh mint and berry aroma. Palate: A long finish in the mouth, maintained by the “rancio” alongside notes of vanilla and Madeira wine.